Chris Holmes is the owner and director of photography of Holmes Photography Studio LLC where they focus on Weddings, Portraits, Corporate as well as Event photography. The studio is located just west of Lansing in Grand Ledge, Michigan in the first floor of the Bridge Street Wedding Chapel LLC, also owned and operated by husband and wife team Chris and Mary Holmes. Chris has a strong photojournalism background serving as chief photographer of the Lansing State Journal for 8 years and as assistant and staff photographer for 10. He is a graduate of the S.I. Newhouse Military Photojournalism Program at Syracuse University. He served as a U.S. Navy Photographer and Photojournalist from 1980-88 covering stories in the U.S., Europe, Cuba, and Antarctica. While stationed in Southern California Chris was introduced to a wedding photojournalism style which at the time was a new way of covering weddings, focusing on real moments with less posing. That influence is very apparent in the wedding photography done at Holmes Photography Studio today. Awards include 2-time international winner of Military Photographer of the Year, Barry Edmunds Understanding Award for the state of Michigan and numerous Associated Press, National Press Photographer and Michigan Press Photographer awards for photojournalism. "We of course take the photos you would expect from your wedding photographer, but our true specialty is catching the "unexpected" moments that tell the story of the day," says Chris. "Our style is a combination of wedding photojournalism, contemporary fine art photography and environmental portraiture. The key to being a successful wedding photographer or photojournalist is to anticipate the action and place yourself in the right place to capture real events as they happen. Moments that are so fleeting, but when captured in a photograph, make you laugh, cry or both. That's when I know I've done my job." If you would like to know more about us outside of photography feel free to read on. Mary and I are blessed with 5 incredible kids and 6 grandchildren. 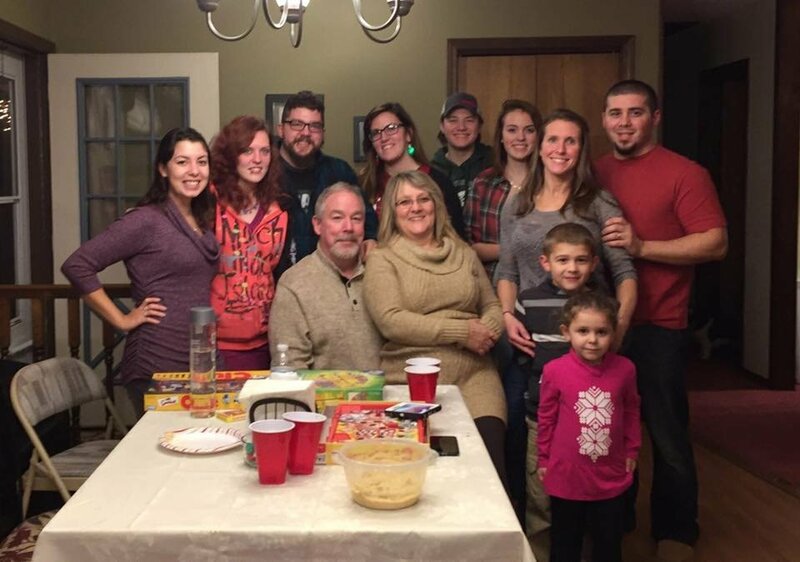 This Thanksgiving was the first time we've been able to have them all under one roof at the same time due to work schedules and two of our kids who live out of town (Wisconsin and Florida). My wife Mary who helps run the chapel and is my number one second shooter is also a 24-plus year employee of the Grand Ledge School District. Two of our daughters are military veterans and our oldest has graduated and is now a nurse. We have a son who is a truck driver and one who is an integral part of running our wedding chapel. Our grandchildren are all athletically oriented from soccer, basketball, wrestling, track, football and motocross! They are following in their parent's footsteps and we couldn't be happier watching them grow into responsible young adults (our oldest granddaughter just got her driver's license - that still amazes me.) Some of the charities we support include the Special Olympics, ASPCA (we are animal lovers for sure). Wounded Warrior Foundation, and other local charities as well. Another subject that is near and dear to our heart is healthy eating and living - at least trying to achieve that on a regular basis. I've personally lost over 80lbs in the past 3 years and with the help of a health coach intend to keep it off. I've never felt better now that I am at a normal weight. Living and eating healthy are some of the hardest things to keep on track but it's so worth it. If you would like to learn more about this subject don't hesitate to contact me. I finally know what works after decades of struggle. Even if you are not in need of photography services we'd love to hear from you. Making friends and being a part of the community is what it is all about.